To call somewhere home is not based solely upon one defining characteristic, but rather a multitude of factors that culminate into one feeling of complete contentment. An essential element to the holistic sensation of home is food. What separates food from a meal, and a meal from an experience is level of courtesy and consideration that is put into the final product. I enjoyed the meals I had during my childhood because my mother prepared them with her family in mind. Similarly, UMass does not just provide you with a meal, but with an experience through which the devotion and care of the Dining Commons shines through day after day. Deliberate actions that leave students satisfied allows us to feel at home within the Dining Commons. The feeling of being cared for is one of reasons why I now call UMass my home. The place where this sensation is most appropriate and where I feel it most is within the Dining Commons. 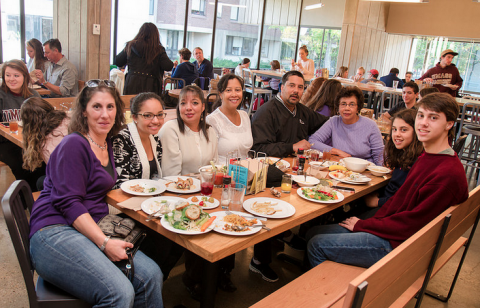 The Dining Commons is one reason why my experience at UMass has been defined in happiness and family. Although the meals of my mother are missed, UMass Dining always succeeds in filling the void left after leaving home.